We left Italy more than two months ago. There has been so much living since then. So much good, so much chaos, so many good meals. Still, sometimes I just close my eyes and imagine myself right there, on that shore, looking at those rocks and the water lapping against them. There was peace. When we were in Italy in May, teaching cooking classes for Jovial Foods, we were content to wander around the villa and meander down the hill to the tiny town at the bottom of that hill. However, one day, the wonderful Carla (head of Jovial Foods and tremendous tour director as well), arranged for a bus to arrive at the villa early the next morning. Anyone want to go to the Cinque Terre? Everyone wanted to go to the Cinque Terre. For decades, I had been hearing from friends that these five tiny towns perched on cliffs above the blue Mediterranean collectively are one of the most beautiful places in the world. How were we going to say no? So we piled into a bus with the folks who were staying at the villa, people whom we had been teaching in classes, then cooking with them, then laughing in the evenings in the enormous villa kitchen. Lu played games with Jenn and Mark, who took astonishing photos of her through the trip. There was much laughter on the curvy winding roads up to the first town. When we all finally tumbled out of the bus, there was much talking and then we stopped. None of us could believe it. How was this place real? 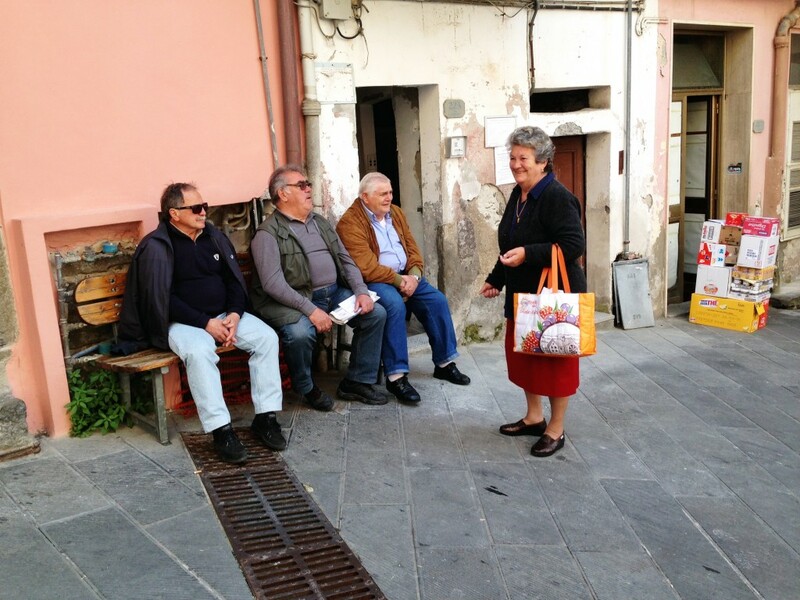 I love the benches of Italy, the old men gathered, gossiping with the woman who walks by. 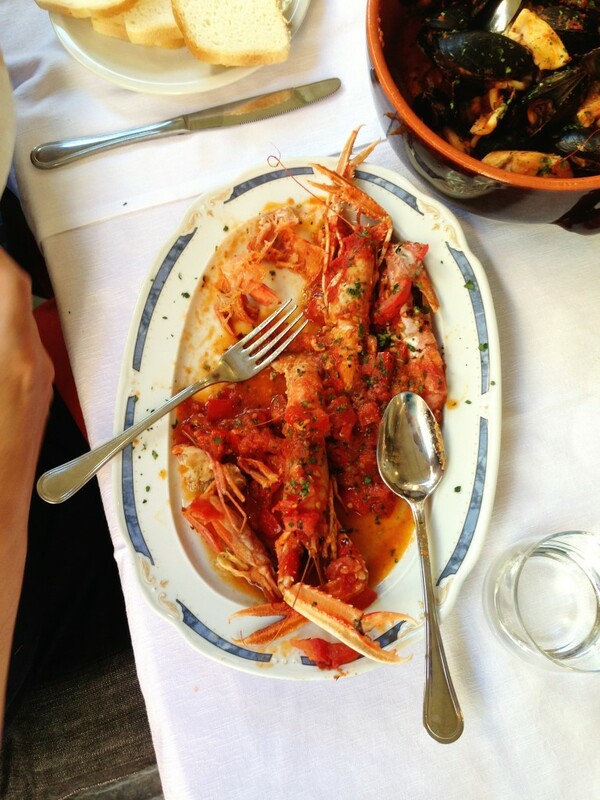 I love the real food of Italy, not the tourist Italian-American food we think of as Italian food. 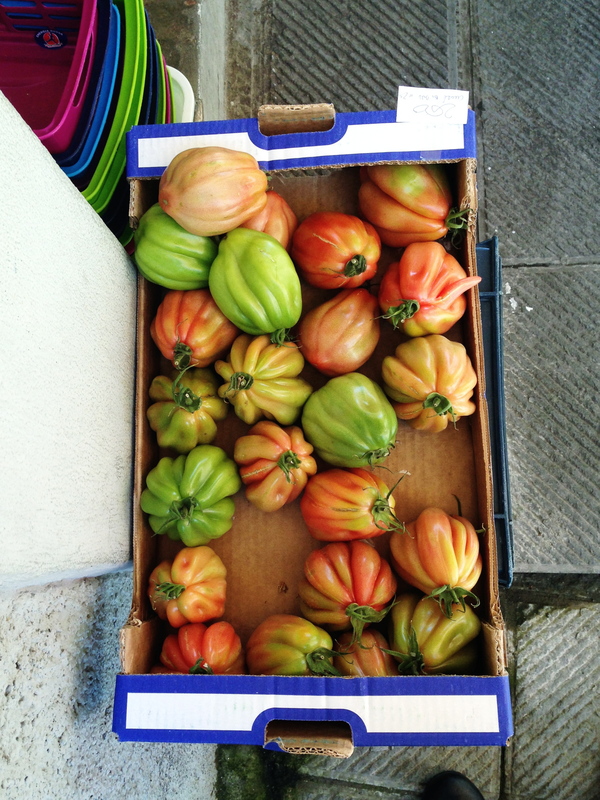 Everywhere we went, the tiny markets displayed boxes of gorgeous ripe fruits in front. Tomatoes had just come into season. And the coffee. 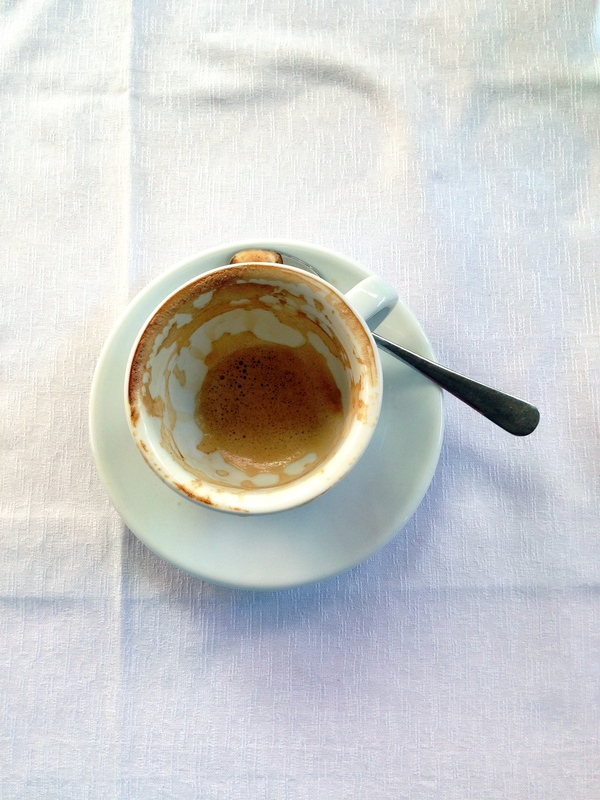 Oh, the coffee in Italy. 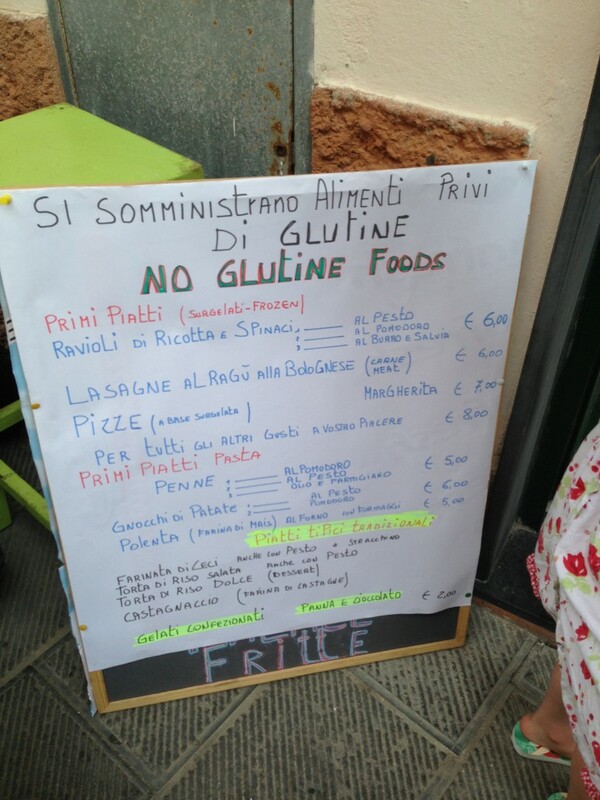 I’ve written this before, many times, but it is wonderfully easy to eat gluten-free in Italy. In the Cinque Terra, we saw this sign a few times, at least. No glutine foods! The restaurant we stopped in, after meandering down the hill with our friends Debra and Rod, had a big SENZA GLUTINE sticker in the window. It really couldn’t be any easier. After making sure I would be fed safely, I forgot the gluten. The waitress brought a basket of stiff gluten-free bread, but I let it sit there. Who needs bread when there were prawns like these? They had been fished out of the ocean that morning. The fresh briny taste of the sea shone through that spicy tomato sauce and the flecks of scallions. It was a dish that called for lots of napkins and loud sucking and slurping and entire enjoyment. After eating this cioppino, with more seafood fresh from the ocean, I’m pretty much ruined for any other cioppino. 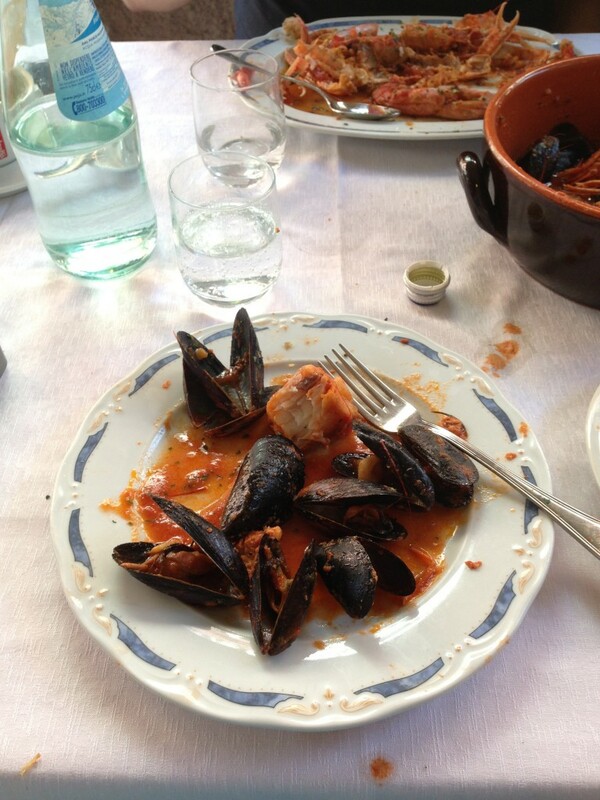 I’m willing to make the sacrifice of not eating cioppino until I get back to the Cinque Terre again. After that long, leisurely lunch  did you know that you can sit in an Italian restaurant without receiving a bill? you have to ask for it if you want to pay  we took a boat, out on the ocean. We let the wind blow through our hair and smelled the salt on our skin for a few moments. And then we walked slowly through the next town. There was gelato, of course. And a slow walk up to the top of the hill to see this. There weren’t many thoughts that day, besides wow. And sigh. And look at that. And how is that real? I love those too-infrequent days, free of thoughts, full of joy instead. Ah well. She had her own experience. And she enjoyed the hell out of her day. 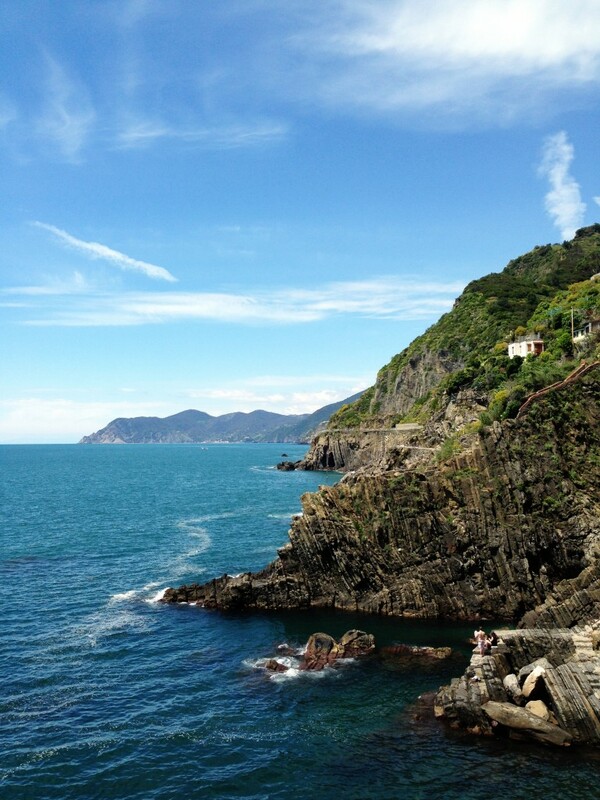 Regular life is rarely as joyful and peaceful as it is on vacation, especially if you’re lucky enough to go to the Cinque Terre in Italy. But that day of calm? It stays with me still. Our days have been far more peaceful this summer than they were before we left. It stamps you, this place. It stays with you. And if I ever need a bit of calm? I look at this photo, remember this moment when I stood on the edge of the ocean, and breathed it all in. We are teaching another week of gluten-free cooking classes with Jovial, in the beautiful villa outside Lucca. 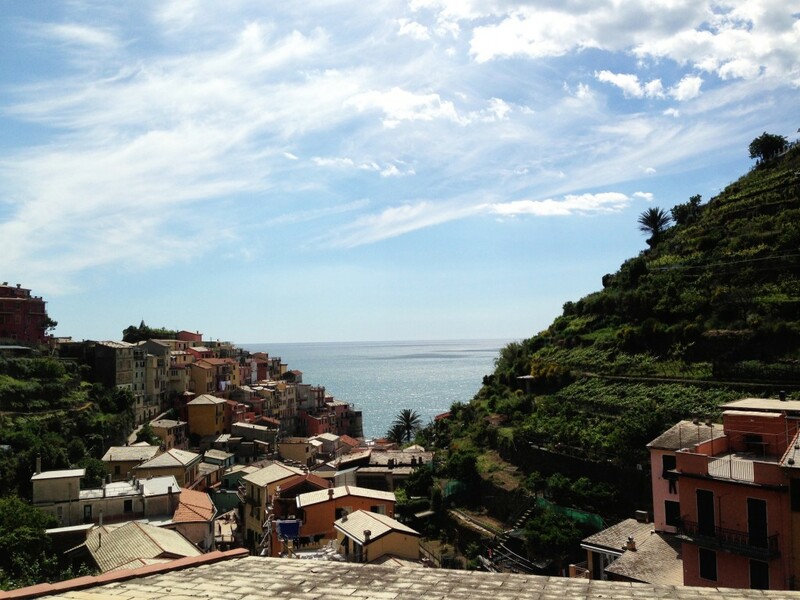 We’d love to see you here, and perhaps take you to the Cinque Terre too. And, if you click on this link, you could win this 8 day/7 night vacation in Lucca for two of you. Go! Enter! 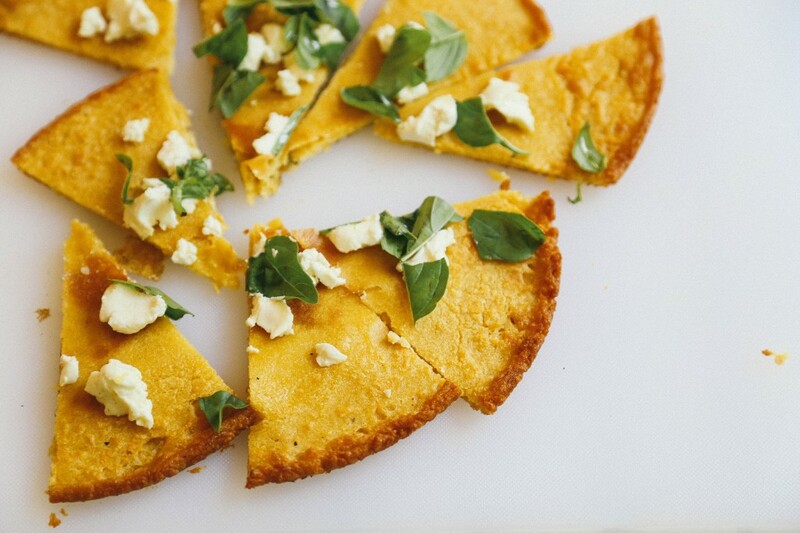 We’d love to meet you and cook with you. Full disclosure. Jovial Foods is one of the sponsors of this website, because we truly believe in the food they make. They paid for airfare for the three of us, as well as putting us up in the villa and providing train tickets. All opinions expressed here are our own. Another week in Italy! You should move here. Europe is an exciting place to spend a few years of one’s life. Thanks for the inspiring post and pictures. It’s nice to be reminded of breath taking beauty like that! I love the recipe too, can’t wait to try it out on my newly diagnosed sons. Beautiful! It is always a treat to wake up and check my blog feed and read about your happy family and how you live and enjoy each day. Your daughter is a lucky girl. We, too, love Italy and have spent several family vacations staying put in one place for a week or two and just “living” there, shopping, cooking, exploring, walking, relaxing. The pace itself is a vacation (other than time in the airports which are pretty stressful over there). From our first trip when my son was five and ordering “una pizza, per favore” with his hands moving along with his mouth, and our daughter was three and getting carsick in the Tuscan hills and eating a gelato a day, to our most recent when they were 20 and 18, we tried to enjoy every minute there. Enjoy your next trip! Beautiful pics. 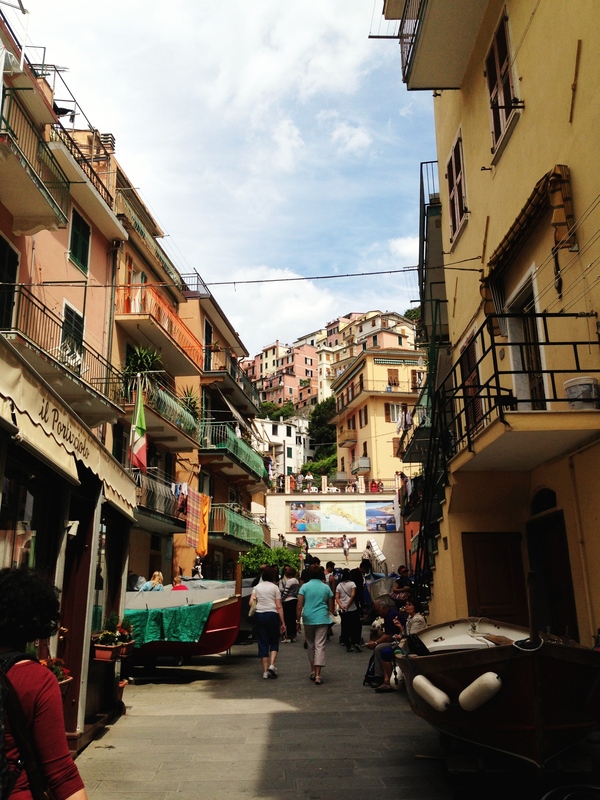 I love Italy and would love to go back and visit the Italian Riviera! Thank you! Goodness, I should probably stop writing these posts at 11 pm. Thanks for catching that. I have been making this for years now, it was one of the crispy salty snacks I needed when I first went GF. I wondered if you or anyone else has had a similar experience to my recent one – instead of letting the water/flour mix sit for 2 hours, I let it sit overnight. When I baked it, it glued itself to the pan! It wasn’t an oil issue, or a pan issue as I tried a cookie sheet and tin foil as well and also tried one pan over the grill. I am guessing that I oversoaked it, but boy, it would NOT come off of anything without a long soak. I have never had that happen before. 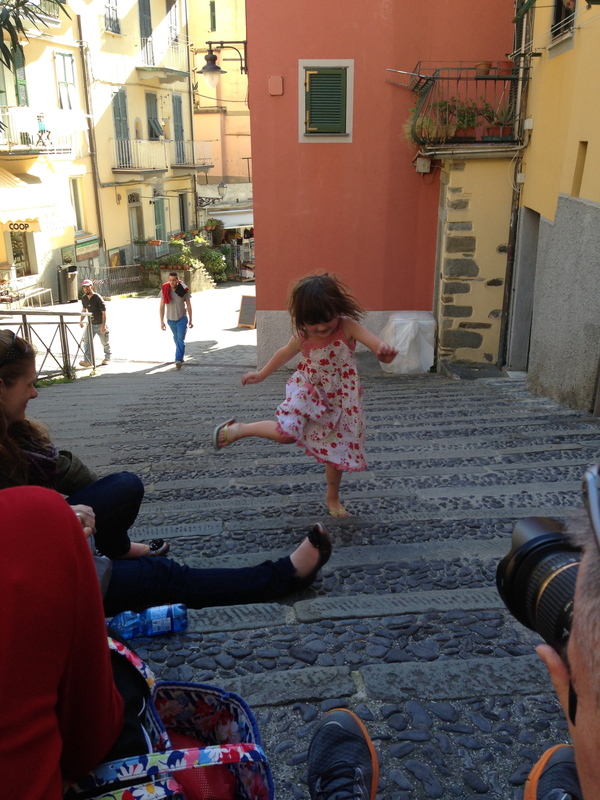 Dear Shauna, oh I so well know that feeling of being awed by the Italian way of life. I was lucky to have spent my childhood summers in Italy. I very much hope to meet you in person one day and perhaps even in Italy. Yes, those Italian moments are special as they teach us a way of life that does only exist in Europe! See you in Italy. So looking forward to it. 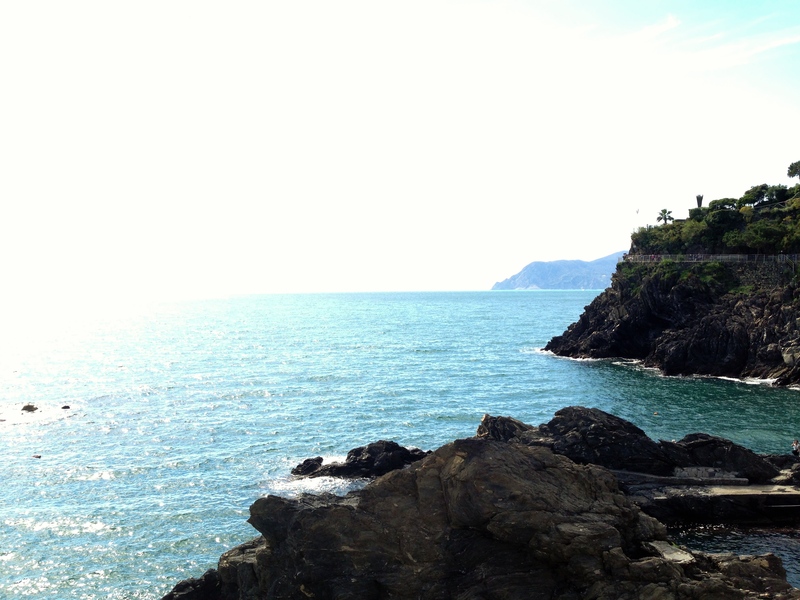 I had the most amazing time in Cinque Terre, it really is a wonderful place with such fantastic seafood. I love the photos you’ve shared with us, especially that one of Lu. Can’t wait to try this dish. I could imagine that Cinque Terre would be a spot Ariel would enjoy very much, so I think Lu’s choice is appropriate! This all looks lovely even though I’m not much of a seafood eater, I’d think it would certainly be worth trying in Italy! This honestly just brings tears to my eyes, that is how badly I want to experience this. Probably won’t get there for another 15 or 20 years, alas. It reminds me so much of Positano! I could cook and live in Italy and day of the week. I love your photos and your recipes!!! Italy……Oh the dreams I have had of Italy…….Prancing through the vineyards with my bare feet, sipping on wine…..Ever since I saw the movie “Only You” with Marisa Tomei ai fell in love. Of course at the time I was a single gal dreaming of getting away. Now I am a Mama to a three year old and the owner of my own Small business, rabbit farm girl, gardening and such in the Skagit Valley. When dreams are worked towards, who knows….. Tonight I dream of salty air, fresh tomatoes and basil, while overlooking my vineyard? Hi, I was wondering if there is a way to enter the contest without being on facebook. I am always so surprised that facebook becomes the end all to some things. So very not interested in being on it. oh Italy! and those tomatoes…and the people…and the water…so beautiful!! 12 yrs ago we were in cinque terre to celebrate my turning 40. now my 6 year old son watches rick steves’ pbs shows about europe and keeps asking me when we’re going there…my favorite memories of vernazza were the site of the main square’s market tables full of fresh fish and the cats winding their way between the feet of the old ladies selling the fish, and the bendy narrow walkways between buildings, and the thousands of steps, and the hilllside olive orchards, and the VIEWS! thank you for refreshing my memories of a memorable trip!